Keep hunger at bay and fulfill all of your guests' snacking needs with this Lance 8 count sandwich cracker variety pack! This assortment features 3 different cracker flavors, offering something for everyone. Toasty peanut butter sandwich crackers and Toast Chee peanut butter sandwich crackers will please all of your peanut butter lovers. Captain's Wafers cream cheese and chives sandwich crackers are packed with classic creamy and zesty flavors. Great deal on a classic and favorite snack. Something very good to keep on hand for employees who may need a little snack while on the clock. These have been a life saver for our kids snacks when going on road trips. They can never decide on the same thing so it is nice to have options. Personally the peanut butter ones are my favorite. These Lance crackers are the exact same quality you would find at grocery stores but at a better price! they were also shipped well and arrived on time. The Lance cracker are fantastic, a great variety and never get old. These are a great price and will last a long time. Will purchase again. These Lance variety pack sandwich crackers are excellent. There are 3 flavors in a box of 8 that are individually packed. Our favorite is the cream cheese and chives sandwiches but the others are great as well. These sandwich crackers are good for snacking as they are filling and nutritious. This variety pack of crackers is delicious!! The flavors are as expected and the packs are individually wrapped. I would order again for the price. The Lance Sandwich Crackers 8 Count Variety Pack is a great addition to our breakroom assortment. Being able to purchase a variety of flavors at these quantities reduces the chances of having too much at a time. These sandwich crackers are delectable. They are perfect for on the go and I love the different kinds. Their peanut butter is so smooth and creamy! These Lance sandwich crackers 8 count variety pack are perfect for packing into school lunches, or as a quick snack before dinner. All varieties are delicious. These are very delicious! They come tightly sealed so none of the crackers will break or crumble. There are three delicious flavors and they’re very filling! These are Lance sandwich crackers. There are 8 packs of crackers and three different flavors. Great for on the go snacks and for packed lunches. Terrific value for 3 cracker varieties. All flavors are delicious and are a great snack that include protein. Wonderful for traveling, on the go and school lunches. This is a peanut butter heavy box. 6 out of the 8 packs are peanut butter. So if you're all about PB, this box if for you! A wonderful variety pack of Lance sandwich crackers that are perfect for our break room. I love the variety pack because you can offer your employees more options. 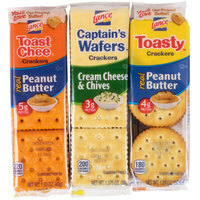 These Lance sandwich crackers variety pack are yummy as snacks. Our favorite is the cream cheese and chives one but we like the others as well. Awesome product for an awesome price. Cant beat this deal and we will definitely be ordering more when we run low. Love these prices a lot. Delicious variety pack of sandwich crackers. Great value, convenient on the go individually wrapped packs. 3 different flavors, affordable, and tasty. These are great for your lobby, break room, or vending machine. Great to have a variety on hand for friends and picnics and guests! They pack well and didn't arrive crushed at all- wow! We found hte chives were the favorite around here. Lance Sandwich Crackers are a great, convenient little snack to have on hand. It is a bargain for a good tasting cracker. The variety of flavors is nice. I am very happy with my purchase of the Lance Sandwich Crackers 8 Count Variety Pack. They are a great snack for home or school lunch. I definitely recommend these crackers. I really like Lance Sandwich Crackers, and I am really glad I found them here on Westaurant! It is a great price for this 8 count variety pack. I purchased this variety set of crackers because of their portability. I keep some in my car for roadtrips, pack them in lunches, and as bedside snacks for overnight guests. What’s nice about the individualized packaging is that they stay fresh and you eat them when you’re ready rather than opening a whole box of crackers that will go stale before you can eat them all. I absolutely love this product! This pack of sandwich crackers come in a 8 count. It's a variety pack with great flavors! Great kids snack. What a great price for an 8 pack of tasty, portable, and packable cracker snacks. I recommend the cheese and peanut butter. These are great to have on hand for a snack attack or for kids of all ages. I have been enjoying Lance brand since I was a kid and I think they make a great sandwich cracker. Great snacks for on the go. These make perfect items to toss in the car or lunch box for a fast premade simple snack. The variety pack comes with 3 flavors so you can find out what flavors you like the most. If you love crackers for snacks this is for you. We however were not very impressed with them and now have a lot of crackers in the house. They will be donated to a food pantry so they won't go to waste here. Lance is a reputable company with a great product. We purchased these for on the go snacks that our kids can enjoy. They are easy to store and to drop in a bag for quick ease and they are delicious!! these crackers are perfect to keep around the break room for our employees. they're a well portioned snack to keep you going through the day. i haven't found a bad flavor yet. These are great to have on hand. They are tasty and filling and convenient to carry. The Lance name is well known for these snacks. These are the perfect snack to have on stock in the office! They are tasty, affordable, and a great snack on the go. I give them five stars. Love this pack! It is a great snack for the kids. Great price for the case! Any other stores, the price on these are just high. I grew up eating these and was so happy to see them on here. No need to decide on one flavor when you get to sample them all. Yum! We love and our quests love these sandwich crackers. All the varieties are good flavors and the crackers are so fresh, crisp and healthy tasting. This variety pack of crackers is a great addition to my bar. They are reasonably priced and provide a good cheap snack with a bit more sustanance then chips and pretzels for my customers. This Sandwich cracker pack has multiple flavors. They come in a variety of different colors and appear very attractive when placed on display near a cash register. Fantastic variety of sandwich crackers. Very fresh. Love them all and will order more again soon. Thanks so much webstaurant for another great order. Five stars yet again!! These sandwich crackers brings me back to my childhood! I put one in my fiancés lunch and he said his coworker were jealous. Now I have to order more!! Definitely have memories of eating these as a kid in school and at home, and now I can keep them on hand for my son to enjoy as well. Variety packs are the way to go so you can pick whichever flavor you (or your child) is in the mood for. Perfect snacks for school or to take on the go. Excellent value for the price and quick shipping. Will definitely keep a supply handy in our home! Excellent value in these crackers. They are wonderful for the snack area or for the break room. We store ours in glass "penny candy" jars. This is typically the variety pack my family stocks and they are perfect for us. Furthermore, since I also use Lance crackers at the shop, I would recommend the variety packs for use there too. When you make a set of bagged lunches for a summer camp or whatnot, the kids really enjoy trading with one another.